Actor Stanley Tucci has stepped into the director’s chair only a few times. As in his previous features, whether as an actor or director, he is recognizable for his dead seriousness in he treats his subjects though his seriousness is often tainted with a wry sense of humour. 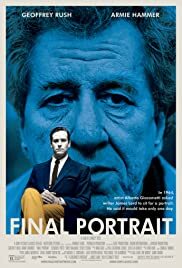 FINAL PORTRAIT is the story of the touching and offbeat friendship between American writer and art-lover James Lord (Armie Hammer) and Alberto Giacometti (Geoffrey Rush) with humour emancipating from the subtle relationship as well as Rush’s comical portrayal of the questionable genius. The story unfolds through Lord’s eyes and revealing unique insight into the beauty, frustration, profundity and sometimes the chaos of the artistic process. Set in 1964, while on a short trip to Paris, Lord is asked by his friend, Giacometti, to sit for a portrait. Lord is promised that the sitting will be a short one, maybe two hours or maybe an afternoon. 9 days later…. Lord finally wonders “how much longer can it go on like this?”, as he keeps having to postpone his flight many times back to New York. The funny thing is that when the portrait is almost finished, Giacimetti will take his large brush with grey paint and paint over the portrait therefore starting again, almost as if from scratch. This process has been repeated so many times that Lord can predict when the process will occur again. He finally finishes up the portrait by stopping Giacimetti from restarting again with the big brush and the grey paint. Tucci is more interested1 in Giancimetti than in Lord. Nothing is much known of Lord, of his living in New York or his family. One scene in a cafe establishes that he is gay and that is about it. Giacimetti’s life is outlined, however, in greater detail. The audience sees the troubled relationship with him and his wife, as well as his relationship, a much happier one with his putain, Carolyn. FINAL PORTRAIT will unfortunately be inevitably compared to the minor masterpiece, the 4-hour long LE BELLE NOISEUSE directed by Jacques Rivette about the relationship between a painter and his model. 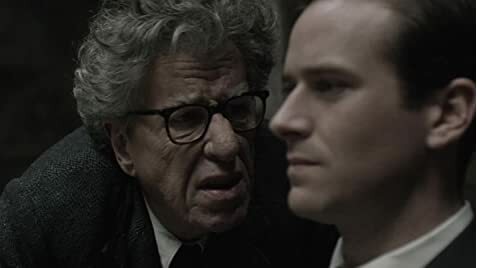 FINAL PORTRAIT can nowhere be compared to this film – in fact nor can any film for that matter, so one can understand director Tucci going the easier comedic route. Rush is pretty good as the temperamental artist while Hammer reprises another gay role after CALL ME BY YOUR NAME. The film has some nice shots of Hammer in his skimpy swimming trunks. Rush is an Academy Award Best Actor Winner for his role in the film SHINE. But he is currently the latest victim under scrutiny for inappropriate (sexual) behaviour. FINAL PORTRAIT was filmed entirely in France. The American speaks both English and French while Rush gets away of being totally believable as a Frenchman fluent in French. The film is shot in both English and French with English subtitles.